What is the Thruway? Which roads are part of the system? The Governor Thomas E. Dewey Thruway, the 570-mile superhighway crossing New York State, is one of the longest toll superhighway systems in the United States. The Thruway's 426-mile mainline connects New York City and Buffalo, the state's two largest cities. The Thruway route from New York to the Pennsylvania line at Ripley is 496 miles long. For a visual representation of the Thruway system, use our On-Line Map. How old is the Thruway? The first section of Thruway, a 115-mile stretch from Lowell to Rochester, opened on June 24, 1954. By December 23, 1960, all 559 miles of the original Thruway system were open. The Cross Westchester Expressway and Interstate 84 were added to the Thruway system in 1991. The maintenance and operation responsibilities of Interstate 84 were reverted to the New York State Department of Transportation on October 30, 2007 to achieve revenue neutrality after the discontinuation of toll collection at the Black Rock and City Line Barriers on October 30, 2006 (revenue neutrality was achieved through funding provided by the New York State Senate for one year. On October 11, 2010, operational maintenance of Interstate 84 was returned to the New York State Department of Transportation. How busy is the Thruway? About 250 million vehicles travel more than 8 billion miles on the Thruway each year. How do I get a job with the Thruway? The Thruway Authority fills most of its positions via Civil Service lists, which are maintained by the NYS Department of Civil Service. Please visit their website for listings of upcoming Civil Service exams and job openings. We also have information on Thruway-specific job opportunities. If you are looking for more specific information, please call our Personnel/Recruitment line during business hours (Eastern time) at 1-800-525-3586. Are tourist information centers located on the Thruway? Yes, there are 10 centers located on the Thruway. Two more are located at Thruway interchanges, and five others can be found within a mile of interchanges. Go to our Information Centers page for specific locations. How many service areas does the Thruway operate? Where are they located? What will I find at each? There are 27 service areas on the Thruway. Each offers a variety of food choices, as well as fuel and other amenities. For more details on each service area and what they offer, go to the Service Areas page found on this site. Where can I find out what the travel conditions are like on the Thruway during periods of inclement weather? The Thruway Winter Traveler Advisory is available during winter months. The Thruway also maintains a toll-free number for customers to call for this information: 1-800-THRUWAY (1-800-847-8929). The recorded message is updated as conditions change and patrons can choose any region for which they would like weather information. Other important Thruway phone numbers can be found on this site's Phone Numbers page. How can I report a pothole that I've seen on the Thruway? Motorists may call 1-800-POTHOLE (1-800-768-4653) to report potholes on any State-owned highway, including the Thruway, except in New York City, where motorists may report potholes by dialing 311. Potholes on county or town roads, city and village streets, or private roadways should be reported to the appropriate owner. Calls received by the hotline are directed to the closest Department of Transportation or Thruway Authority maintenance facility, from which a maintenance crew will be dispatched as soon as weather conditions and other factors permit. Individuals calling the hotline will be asked to provide detailed information regarding the location of the pothole, including: the name of the community or county, state route number or interstate; closest reference marker number; closest exit number; the direction of travel and the nearest landmark or crossroad. How can I find out what my Thruway tolls will be? Tolls on the New York State Thruway are calculated according to the height of the vehicle, total number of axles of a vehicle, and distance traveled. The Authority provides a Toll & Distance Calculator which will estimate tolls, distance and travel time for entry and exit points anywhere on the Thruway system for all vehicle classifications. Patrons are required to enter the height and number of axels on the vehicle. In addition, the Authority offers an On-Line Toll Ticket which can be used to determine passenger vehicle (class 2L) tolls. The Authority also offers information on other vehicle classifications. How do I determine the height of my vehicle? Measurement is taken at the highest point of the vehicle over the first two axles. Typical home garages feature 7 feet high doors. 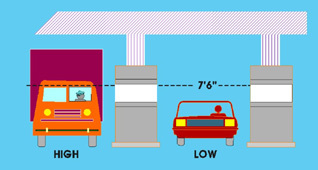 If your vehicle fits in a standard garage, then it is probably under 7 feet 6 inches. If you are unable to measure the height of the vehicle, check your owner's manual or manufacturer documentation. How do I determine the number of axles on my vehicle? An axle is a shaft around which a wheel or a pair of wheels revolve. Most passenger cars are considered to have 2 axles for classification purposes. To determine the number of axles on the vehicle or vehicle combination, look at the vehicle from the side profile and count the number wheels or pair of wheels from front to back. How can I obtain a Vehicle Classification and Toll Schedule Chart? Vehicle Classification information and Toll Schedule Charts are available online, by calling the Authority's Division of Toll Collection at (518) 436-2805, or by emailing the Authority by using the online contact form. I carry items, such as a kayak, on my roof rack. That makes my vehicle height over 7' 6". Will this affect my vehicle classification? No. Non-permanent items (examples: kayak, bicycles, ladder, snow board, luggage carrier) carried on a passenger vehicle's roof (Class 2L, 3L, or 4L) are not considered when determining vehicle classification. I am carrying an item, such as a refrigerator, in the back of my 4X4 pick-up truck; does this make my vehicle high? No. Non-permanent items carried in the bed of a pick-up truck (Class 2L, 3L, or 4L) are not considered when determining vehicle classification. I have dual rear wheels on my pickup truck. Does this affect my vehicle classification? No. Dual rear wheels are not a determining factor for vehicle classification. Classification will be based on height and axles regardless of the number of tires on each axle. I have a 15 passenger commercial van. What is my vehicle classification? The number of passengers is not a determining factor for vehicle classification. Classification is based on height and axles, regardless of the passenger capacity. I drive a conversion van. What is my vehicle classification? Conversion vans are classified as a passenger vehicle (Class 2L). However, if your conversion van has features similar to a "motorhome," for example, a cook top/range, microwave, a sleeping area, or tub/shower/toilet amenities, this vehicle would not be classified as a traditional passenger vehicle (2L), but rather a motorhome, while traveling the New York State Thruway. The Thruway Authority does offer a Thruway Motorhome Discount Plan via E-ZPass. I tow a fifth wheel mounted camper/travel-trailer/horse-trailer. What is my vehicle classification? Vehicle classification is based on the height of the vehicle over the first two axles, including any trailer, and the total number of axles. A vehicle's combination is considered HIGH if the height of the vehicle over the first two axles is 7'6" or greater. For example, a 2-axle pick-up truck with a 2-axle 5th wheel trailer, 7'6" or greater, which extends forward over the rear axle, would be classified as a 4H. Using this same logic, a 2-axle pick-up truck with a 3-axle 5th wheel trailer, 7'6" or greater, would be classified as a 5H. E-ZPass discounts are available for these vehicle combinations; however, special tags are required that must be programmed specifically for the specific vehicle combination. To be eligible, customers must first have an established E-ZPass account with the New York E-ZPass Customer Service Center. There are no discounted rates available to cash customers. I pull a car with my motor home. Do I need two tickets? No. Vehicle combinations will be classified based on the total number of axles and vehicle height, including any towed vehicles or trailers. Cashless Tolling is a free flowing tolling system that operates without toll booths or barriers. It saves motorists time and money, improves safety on the roadway and reduces congestion and air pollution. Cashless tolling is currently in place at the Governor Mario M. Cuomo Bridge and the Grand Island Bridges the fixed toll barriers in the lower Hudson Valley including Harriman, Yonkers, Spring Valley and New Rochelle and will expand system-wide in 2020. Tolls are collected either by E-ZPass or through Tolls By Mail . Go to our Cashless Tolling section for more information. What is Tolls By Mail? The Thruway Authority contracts with Tolls By Mail to bill customers without an E-ZPass, after they travel through a cashless tolling location such as the Governor Mario M. Cuomo Bridge and the Grand Island Bridges, and the four fixed toll barriers in the Hudson Valley: Harriman, Yonkers, New Rochelle and Spring Valley. After a motorist travels through a cashless facility, an image is captured of the license plate. A toll bill is mailed to the registered owner of the vehicle at the address on file with the Department of Motor Vehicles. Payment can also be made on the Tolls By Mail website or by calling the customer service center at 1-844-826-8400. I just traveled over the Governor Mario M. Cuomo Bridge, the Grand Island Bridges, or the Harriman, Yonkers, New Rochelle or Spring Valley Toll Barriers. How do I pay my toll? If you have E-ZPass, your toll is collected using the same process that you are already familiar with. Motorists without an E-ZPass using the cashless tolling system can pay their toll bill a variety of ways. After a motorist travels through a cashless facility, an image is captured of the license plate. Using the address on file with the Department of Motor Vehicles, a toll bill is mailed to the registered owner of the vehicle. Payment can also be made on the Tolls By Mail website or by calling the customer service center at 1-844-826-8400. Can I pay my toll with use of a credit card at the toll booth? No, only cash and E-ZPass are accepted as payment at NYS Thruway toll booths. When you open an E-ZPass account, you can fund your account with a credit card through our automatic replenishment billing. This will ensure there are always funds in your account for tolls. To find out where you can purchase an E-ZPass tag at a retailer near you (On-the-Go) or to sign up online, visit www.e-zpassny.com. I might have gone through an E-ZPass lane, but I don't have E-ZPass. Is that an unpaid toll? Unpaid toll slips are issued at the toll booth when a customer has insufficient funds to pay at the time of the transaction, and must be paid within 7 days. Driving through an E-ZPass lane without a valid E-ZPass tag will automatically generate an E-ZPass violation which will be mailed to the registered owner of the vehicle. These violations should be handled through E-ZPass . Please retain your toll ticket and wait to pay your toll until you receive a notice from E-ZPass. Visit the Unpaid Toll Payments section for more information. What if I lost my unpaid toll slip? If you lost the unpaid toll slip received at the toll plaza and are unsure of your toll amount, or where you might have received your unpaid toll, please call (518) 471-5051 and provide your driver's license identification number and any information about the date and location of your travel. You will be instructed how to make a payment. You may refer to the Toll & Distance Calculator to be sure your unpaid toll occurred on the NYS Thruway. Can I still make a payment after the 7-day required payment period? Yes. In order to avoid late payment notices and other consequences, please make your payment as soon as possible as described in the previous steps. I have noticed recently when obtaining a toll ticket on the NYS Thruway a bar code type box on the bottom right side of the ticket, what is this?, and what is it used for? This is a Quick Response or QR code recently added this to all toll tickets on the NYS Thruway's ticketed system to continue our commitment to provide and improve customer service. This code, when scanned by a Quick R scanner that can be downloaded for free on a smart phone, will bring customers to the mobile version of our website for easy access to the Toll & Distance Calculator page, and other traveler services information from our website. Warning: Use Toll and Distance Calculator when it's safe and legal to do so. What is E-ZPass? How do I get it? E-ZPass is an electronic toll collection system which takes cash, coins and toll tickets out of the toll collection process. Instead, drivers pre-pay tolls and attach a small electronic device to their vehicles. Tolls are automatically calculated and deducted from the pre-paid accounts as E-ZPass customers pass through the toll lanes. The Thruway Authority was the first toll agency in the Northeast to offer electronic toll collection to its customers. View of map of where E-ZPass is accepted. E-ZPass information and applications can be obtained by calling 1-800-333-TOLL (1-800-333-8655). Applications are also available online at www.e-zpassny.com. More E-ZPass information is available on the E-ZPass page. Do E-ZPass customers get a discount? Yes. E-ZPass customers will receive a 5% discount off the cash toll rate. Sign up for E-ZPass today. *Note: E-ZPass rates apply only to customer tags issued by New York E-ZPass Customer Service Center (This includes: MTA Bridges and Tunnels, Port Authority of New York and New Jersey, New York State Thruway Authority, the Buffalo and Fort Erie Public Bridge Authority (Peace Bridge), and New York State Bridge Authority). Non-NY CSC customers will pay cash or Toll by Mail rates. Anyone, regardless of residency, can apply for a New York Customer Service Center-issued E-ZPass tag. Visit www.ezpassny.com for more information or call 1-800-333-TOLL (8655) to use our automated system for account inquiries and general E-ZPass® New York information. How can I apply for E-ZPass to make toll payment easier? E-ZPass is both convenient and cost-saving, offering a five percent toll savings on the Thruway. You can become an E-ZPass customer by applying through the mail, online at www.e-zpassny.com or by visiting one of the retail locations across the state. Are New York State Thruway tolls waived for U.S. Military Veterans? Only Disabled Veterans holding a FEE EXEMPT registration can qualify to travel the Thruway toll free. Qualification does not depend on VA plates. More information is available on the Disabled Veterans page. I am a commuter. What discount plans are available? The Thruway’s $88 annual permit discount plan is available for commuters’ using the Thruway’s ticketed system. Commuter discount plans for the New York and Buffalo Regions fixed toll barriers and bridges (New Rochelle, Yonkers, Governor Mario M. Cuomo Bridge, Harriman, and both Grand Island Bridges) are also available. View E-ZPass Discount Plans. To enroll in one of the various commuter plans, customers must first have an established E-ZPass account. Current E-ZPass customers must call 1-800-333-8655 to sign up for a commuter discount plan. Customers enrolling in E-ZPass for the first time may choose a commuter plan during the E-ZPass application process. How do I find out more about discounts for motorcycles and/or motor homes? Discounts are available through the E-ZPass program. Proof of vehicle registration is required for both plans. Motorcycles are charged half of the cash toll rate. Motor homes receive the passenger vehicle rate based on the number of axles on the motor home. To enroll in the motorcycle or motor home discount plan, call 1-800-333-8655 or visit one of the Authority’s seven E-ZPass Service Centers. What is the New NY Bridge project? The New York State Thruway Authority replaced the Tappan Zee Bridge with the Governor Mario M. Cuomo Bridge, a 3.1-mile state-of-the-art, twin-span bridge across the Hudson River between Rockland and Westchester counties. The $3.98 billion project was one of the largest single design-build contracts for a transportation project in the United States. Find out more about the project on the website. When did the new Governor Mario M. Cuomo Bridge open? The first span of the Governor Mario M. Cuomo Bridge opened in August 2017. All traffic from the former Tappan Zee Bridge was temporarily shifted onto the first span, until the second span opened in September 2018. The fully completed project will have eight general traffic lanes, breakdown and emergency lanes, dedicated bus lanes in each direction, and a bicycle and walking path. What is the Hudson Link? Hudson Link is an enhanced bus service that takes commuters across the Governor Mario M. Cuomo Bridge and within the I-287 corridor. It features new, world-class buses and intelligent transportation management technology with real-time traffic information for commuters. Hudson Link, run by Transdev, provides more than 230 one-way rides per day between Rochester and Westchester counties with an estimated annual ridership of more than 400,000. Commuters are taken to Metro-North stations in Tarrytown or White Plains, both in Westchester County. For more information on the service and to access the transit schedules, visit www.ridehudsonlink.com . Are there bus lanes on the Governor Mario M. Cuomo Bridge? Yes. A dedicated bus lane on the eastbound span opened in late October 2018. The westbound lane will be available for use after construction of the shared use path is complete in 2019. The bus lane is located on the right side of the road, between the general travel lanes and the outside shoulder. Only vehicles with seating for 15 or more passengers are permitted to use the bus lanes. These include Hudson Link buses, charter buses, school buses, and other regional public transit buses. New York State Police are responsible for enforcing the proper use of the bus lane on the bridge. The first violation will carry a fine of $150, and the penalty would escalate for any repeat violations within an 18-month period. What are ramp meters and where will they be located?